The group members turned up in festive mode including David in his festive Pjs … to do the bedding plants ! boom boom! It was a nice large sparkling group, with all staff and group members ‘present’ (oooh!) for the Christmas celebration. We started as usual with check-in, sharing the experiences and feelings we had over the past week and supported each other where needed. A lot of ‘elfie’ photos were taken of the jovialities and we played a game which helped us find out new things about each other. Each person wrote something about themselves on a piece of paper which was put into a bag. Next, each person picked a piece of paper and read it out and the rest of the group had to guess which person it belonged to. Lunch time arrived so one group assembled our Christmas feast whilst others skived, got the fire fire going again and set the the table. 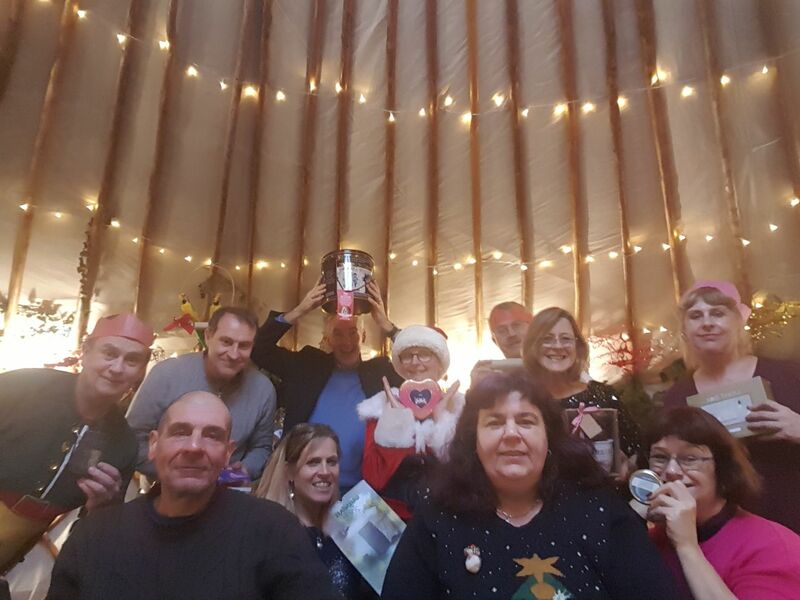 We waited for Rex who popped in like the naughty elf, saying he’d be back but we had to wait until the end of group to see him again as he had a nightmare journey getting back to us. Replete after lunch, we played another game whilst we digested, which proved us to be excellent liars. Each person had to say three things about themselves, two false and one true (or vice versa) and the others had to guess which. Father Christmas had left presents for all the good Yurties – despite the dubiousness of their being good, we only had their word for it. (See above paragraph). We checked on our crop and Alison, our old friend and visiting horticulturist, said the seedlings are amazingly sturdy little so and sos. Good news! Johnny getting ready to rock with Alison looking on. Our resident minstrel Johnny, delighted us by playing his mandola and with his beautiful lilting singing voice. We also enjoyed a musical interlude of Kirsty McColl and the Pogues. It was also a day trying new things such as stinky cheese and a mango. Good times! 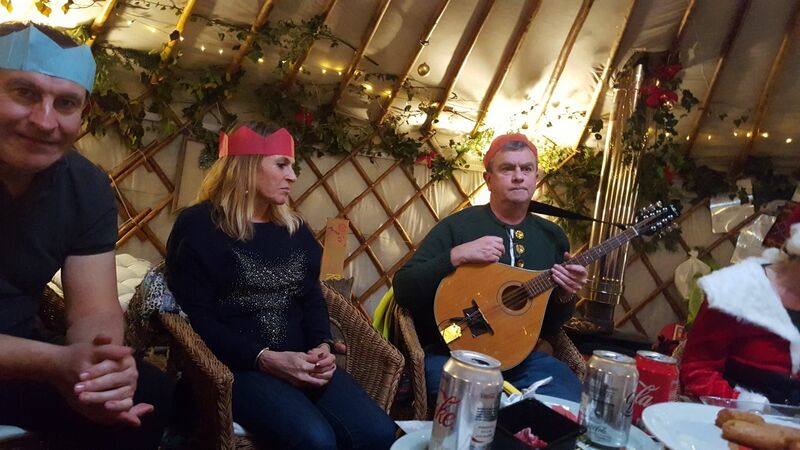 All found the day a relaxing experience with feelings of togetherness in the Yurt to start off Christmas break. Everyone was delighted with their presents and were amazed how tuned we were with each other with the choice of presents. We ended our last session of 2017 on the shortest day of the year, from now on days will get lighter and longer and spring wont be very long away. We wished each other the Christmas we would wish for before making our way homeward. Here’s to next year, may it be the best year ever!